We get lots of questions about toe-up v. cuff down, so we decided to let you try for yourself. This class will work with a worsted weight yarn and create the perfect slipper sock as we move to those chillier times. In the sessions you will learn to work with Magic Loop, Judy's Magic Cast-on, and the easiest stretchy bind-off. You will have the pair complete in no time. You can either Knit or Crochet this great bag which will be perfect for shopping, sunning, sailing - whatever you want. Several of our knitters use this amazing technique which comes with the benefits of being more ergonomic and possibly faster. The Class will provide you with the history and benefits of the technique along with practice. 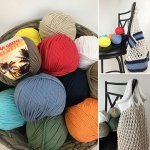 This class is for anyone who has the basics of Crochet and wants to expand your knowledge with increasing, decreasing, combination stitches and reading a pattern.